Last September, Gov. Bill Walker gave himself a year to decide if the $43 billion Alaska LNG project should survive, a decision he said he'd make based on whether the project had sufficient interest from potential gas buyers and pipeline investors. On Wednesday, after the year had passed, he said in an interview that the project should live for now based on the "unprecedented" level of interest it has received from potential gas buyers, investors and top Asian leaders. Support from a newly installed presidential administration in Washington, D.C., that says it is anxious to develop the nation's resources is also key. "If a year ago someone had told me about all the things that would have changed in our world by this time, I would have been pretty excited," he said. Pulling the plug now would be "irresponsible," he said. Walker's commitment comes despite Alaska's $2.5 billion budget deficit and the project's steep costs, plus project challenges that include the departure of the state's one-time pipeline partners — Exxon Mobil Corp., ConocoPhillips and BP — amid low gas prices and a global glut of liquefied natural gas projects. The state and those ex-partners have spent more than $500 million on the project since 2012. Now the sole owner, the state proposes moving the North Slope's giant gas reserves in an 800-mile pipeline, superchilling the gas into a liquid in Southcentral Alaska, and shipping it in tankers to Asian markets. Gas is not expected to flow until at least 2023, if ever. Since taking over the project, the state-chartered Alaska Gasline Development Corp. has worked to lower costs and find new investors and gas buyers to sign contracts that could underpin financing agreements. AGDC officials have said the project can return healthy profits to the state for decades. The agency is working to receive an environmental impact statement from the Federal Energy Regulatory Commission, a key step to support permitting decisions by agencies. Now that the state has had a year to drum up market interest, Walker on Wednesday acknowledged that the agency has not yet signed binding agreements with possible investors or LNG buyers. But the agency has said it's making progress. On Aug. 31, it completed an 11-week "open season," after giving Slope producers and LNG buyers and traders a chance to request capacity in project facilities, such as the pipeline. On Wednesday, the agency announced one Alaska producer met the state's guidelines in expressing its intent to reserve capacity in the system. The agency did not name the producer. Also, Exxon Mobil, BP and ConocoPhillips expressed an interest in selling their Slope gas to the agency, so it could be sold to other buyers, the statement said. Not stated was whether buyers or traders had also offered to reserve capacity in Alaska LNG facilities as part of the "open season." But AGDC Commercial Vice President Lieza Wilcox said Aug. 10 that the agency had signed 17 confidentiality agreements and is reviewing 13 draft letters of intent involving entities from different countries. The commitments aren't binding. In June, the agency announced the signing of a nonbinding memorandum of understanding with Korea Gas Corp., to promote discussions that might lead to a partnership between the state and that company. The agency has set May 31 as the deadline to sign binding agreements. State Sen. Cathy Giessel, R-Anchorage and chair of the Senate Resources Committee, said MOUs such as the one signed with Korea Gas "aren't worth the paper they're written on." Giessel, a political opponent of Walker's, on Tuesday sent a request to the AGDC to determine if it has received "viable" offers, particularly from LNG buyers or traders. Interest from those parties would help assess the interest in the market for the project, she said. From her email communications, including with AGDC President Keith Meyer, she understands no offers came from LNG buyers or traders, she said. "I want to know who is offering to buy this gas and who is willing to go in this with us," said Giessel. "Unless something significant has changed, this is the same situation we were in a year ago, when the major oil companies said this (project) just isn't viable at this time," she said. This spring, the Senate had initially sought to pull $50 million of the remaining $100 million held by the agency. But in a capital-budget deal struck with the House, the Senate left the $100 million. Giessel said the money is expected to last through June 30, the end of the 2018 fiscal year. The point at which AGDC's money runs out will create a natural deadline for his next major re-evaluation of the project, Walker said. He said he has never asked the Legislature for AGDC money, but if he decides again that the project should continue, that's a step he'd have to take. "I'm just playing the hand I've been dealt," he said. Walker said positive marketing developments have included personal discussions about the project with Chinese President Xi Jinping and South Korea President Moon Jae-in, opening the doors to further meetings with officials from those countries. Efforts by Walker and AGDC to promote the project at Asian conferences the past two years have also led to additional meetings. An important follow-up came in early August, when Tokyo Gas President Michiaki Hirose traveled to Juneau and discussed the project with Walker and other state officials, he said. President Donald Trump and his administration have shown key support. The IRS has granted tax-exempt status to the agency, Walker said. "That's a tremendous amount of activity in a year," Walker said. Walker said he's "puzzled" by critics of the project who don't seem interested in giving a full shot to the effort to monetize the state's gas and create jobs. "I can say with assurance I think we've never seen" such levels of interest, he said. Rep. Andy Josephson, D-Anchorage and co-chair of the House Resources Committee, said he hears often from people who want the project stopped. Josephson said he's interested in keeping Alaska LNG alive for now. The Legislature gave "reluctant" but "tacit" approval for the project, at least until the $100 million is spent. 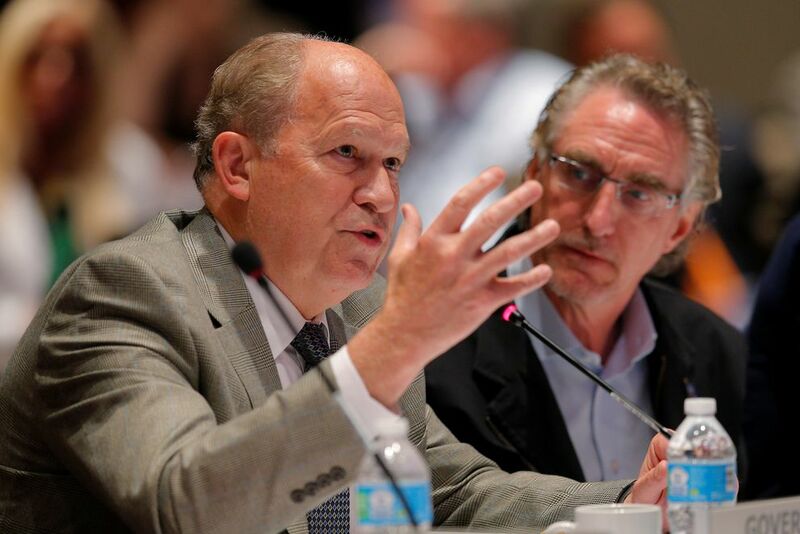 He said voters should consider Alaska LNG's survival during the governor's race to be decided in 2018. "The public can have a say in it," Josephson said.